Nahum Sokolow (Nahum ben Joseph Samuel Sokolow, Hebrew: נחום ט' סוקולוב Nachum ben Yosef Shmuel Soqolov, Yiddish: סאָקאָלאָוו‎, 10 January 1859 – 17 May 1936) was a Zionist leader, author, translator, and a pioneer of Hebrew journalism. Nahum Sokolow was born in Wyszogród, near Plock, Poland (then Russian Empire). He began to attend heder at the age of three. When he was five, his parents moved to Plock. At the age of ten, he was already renowned as a Hebrew scholar. His father wanted him to study for the rabbinate but with the intervention of Baron Wrangel, the governor of Plock, he enrolled in a secular school. He married at eighteen and settled in Makov, where his father-in-law lived, and earned a living as a wool merchant. At the age of 20, he moved to Warsaw and became a regular contributor to the Hebrew daily HaTzefirah. Eventually he wrote his own column and went on to become editor and co-owner. In 1914, after the outbreak of World War I, he moved to London to work with Chaim Weizmann. Sokolow died in London in 1936. Sokolow was a prolific author and translator. His works include a three-volume history of Baruch Spinoza and his times, and various other biographies. He was the first to translate Theodor Herzl's utopian novel Altneuland into Hebrew, giving it the name Tel Aviv (literally, "An Ancient Hill of Spring"). In 1909, the name was adopted for the first modern Hebrew-speaking city. In 1906 Sokolow was asked to become the secretary general of the World Zionist Congress. In the ensuing years, he crisscrossed Europe and North America to promote the Zionist cause. After moving to London, he was a leading advocate for the Balfour Declaration of 1917, in which the British government declared its support for a Jewish homeland in Palestine. On 6 February 1917 a meeting was held in Maida Vale with Weizmann to discuss the results of the Picot convention in Paris. Sokolow and Weizmann pressed on after seizing leadership from Gaster; they were granted official recognition from the British government. Historian Martin Kramer argues that securing the assent of Britain's French and American Allies, and of the Vatican, which controlled many Christian Holy Sites in the Land of Israel, was a necessary precondition of the Balfour Declaration. Sokolow secured the support of Pope Benedict XV on 4 May 1917. Pope Benedict described the return of the Jews to Palestine as "providential; God has willed it.". Sokolow secured the assent of the France in the Cambon letter of 4 June 1917, signed by Jules Cambon, head of the political section of the French foreign ministry. Chaim Weizmann wrote to the Manchester Zionist, Harry Sacher, who became a focus for the view that Sokolow and Weizmann had capitulated; forfeiting the right to lead by "preferring British Imperialism ... to Zionism". 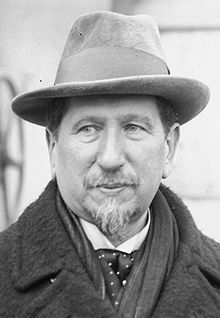 Sokolow acted as Weizmann's eyes and ears in Paris on a diplomatic mission with Sir Mark Sykes to negotiate with the French. The idea that the Jews would form a new kind of Triple Entente under the Ottoman Empire was unsettling to them. Nonetheless the delegation left for Paris on 31 March 1917. One purpose of the Entente was to strengthen the hand of Zionism in USA. "The Jews represented a powerful political and economic force...if subterranean influence". Sokolow did not know of the Sykes-Picot Agreement and British/French understanding on Middle Eastern policy matters. He believed that he must report to Weizmann that what France really meant by a "Greater Syria", taking the whole of Palestine for themselves. In a series of letters in April and May 1917, Weizmann accused Sokolow of letting the Zionists down in negotiations with France; Sokolow countered by replying that he remained totally committed to a British Palestine. Yitzhak Ben-Zvi addresses Zionist General Council meeting in Jerusalem, 1935. From right to left: I. Rupaisen, Ben-Zion Mossinson, H. Farbstein, Nahum Sokolow, Yitzhak Ben-Zvi, Yosef Sprinzak, I. L. Goldberg, Shmaryahu Levin, Eliezer Kaplan. The desiderata or things desired by the Jews for their new homeland – "facilities of colonization, communal autonomy, rights of language and establishment of a Jewish chartered company." Sokolow eventual diplomacy triumph for Zionism in Paris "they accept in principle the recognition of Jewish nationality in the capacity of National Home, local autonomy etc. It is beyond my boldest expectations...", he wrote. They expected a quid pro quo for support against Germany, which was further made urgent by the entry of USA on 6 April 1917 to the global conflict. They now associated an Allied victory with securing "Zionist aspirations", a phrase also used by Sykes in his despatches to Balfour. On 9 April, the Paris conference ended, marking a high-point in Sokolow's career. The Zionists were now open to all diplomatic rounds. Sokolov came to Rome to gain support for the plan of a Jewish state in Palestine, where he spoke to Monsignor Eugenio Pacelli, the future Pope Pius XII. That Pope Benedict XV had vehemently condemned antisemitism a year before was seen as a good omen. In Rome, the Vatican City were considering accepting terms. Sokolow's letters asked advice from Weizmann; the amazed Sokolow met the Pope on 6 May. The Zionists began to feel more confident about their patriotism. Sokolow asked for "moral support" – a philosophical equality, and immediately wrote Weizmann about the "expressing of favour". But Weizmann was not so emotional; being tough hard-headed business-like character. He congratulated Sokolow on the success. Sokolow was called upon to stop at Paris by Jules Cambon and Prime Minister, Alexandre Ribot. They were still concerned that Zionism would cause unlimited damage to world security if unleashed in Bolshevik Russia. In 1931 Nahum Sokolow was elected President of the World Zionist Congress, and served in that capacity until 1935, when he was succeeded by Chaim Weizmann. He also served as President of the Jewish Agency for Palestine (now called the Jewish Agency for Israel) between 1931 and 1933 and was succeeded by Arthur Ruppin. Kibbutz Sde Nahum is named for him. ^ "Our Leader Nahum Sokolov Celebrates His Seventieth Birthday: Statement Issued by Zionist Executive:". ^ Medoff, Rafael (5 September 2013). "Historical Dictionary of Zionism". Routledge – via Google Books. ^ a b Kramer, Martin (12 June 2017). "How the Balfour Declaration Became Part of International Law". Mosaic. Retrieved 14 June 2017. Bauer, Ela (2005). Between Poles and Jews: The Development of Nahum Sokolow's Political Thought. Jerusalem: Hebrew University Magnes Press. Dekel, E (2000). Shai: The Exploits of Hagana Intelligence. New York. Friedman, Isaiah (1977). Germany, Turkey and Zionism, 1897–1918. Oxford. Raisin, Max (1970). Great Jews I have known: a gallery of portraits. Ayer Publishing. ISBN 978-0-8369-8023-3. Sacher, Harry (1916). Zionism and the Jewish Future. London. Sokolow, Nahum (1919). History of Zionism: 1600–1918. Longmans, Green & Co., London. Sokolow, Florian (1975). Nahum Sokolow. London. Wolf, Lucien (1934). Essays in Jewish History (Cecil Roth ed.). London. Rawidowicz, S (May 1941). "Nahum Sokolow in Great Britain". New Judea. Wagner, S (August 2008). "British Intelligence and the Mandate of Palestine: Threats to British National Security Immediately after the Second World War". Intelligence and National Security. 23 (4): 435–462. doi:10.1080/02684520802293049. Wikimedia Commons has media related to Nahum Sokolow. This page was last edited on 3 March 2019, at 09:23 (UTC).